It is Necessary to Stretch? Is stretching for runners necessary? Do you stretch before you run or do you stretch after you run? Maybe you don't stretch at all. Maybe you don't think stretching is necessary. Some runners don't. All our bodies respond differently to a running workout. Stretching directly after a run works best for most runners. Some wait 20-30 minutes after running to stretch. You need to experiment to see what works best for you. During the first few years that I was running, I experimented with stretching immediately following a long run and also with waiting until later to stretch. For me, stretching immediately after running was more beneficial. Stretching before a run should not be necessary if you ease into your workout by walking first or by starting out slowly. However, some runners feel they need to stretch to make the transition from work to workout. If you stretch before you run, make sure you warm up first. Perhaps more important than when you stretch is how you stretch. Gently ease into a stretch. Relax and take a deep breath. Then stretch gently. Don't bounce or push hard into the stretch. Don't force the stretch and please don't grit your teeth as I see so many runners do when they are stretching. A stretch should not be forced and it should not be painful. Be kind to your body. It shouldn't hurt to stretch. Relax into the stretch and hold for about 30 seconds. Repeat as you feel is necessary. The more your body is relaxed, the more beneficial the stretch will be. You can also try Active Isolated Stretching. It is the method that many professionals recommend as the most beneficial way of stretching for runners. Lactic acid can accumulate in the muscles while running. It can cause your muscles to become stiff and sore. Stretching will help flush the lactic acid and keep you flexible. Muscles contract during running. Stretching helps to elongate these muscles and reduces the risk of injury. Flexibility and stretching for runners can also be achieved through Yoga for Runners. One of the most important areas that runners forget to stretch is their lower back. Many runners experience tight back muscles while running resulting in lower back pain following a run. Even if you don't suffer from lower back pain after running, it is a good idea to stretch your back and your spine. With gravity and the constant pounding of your body during running, the spine becomes compressed. Stand with your knees bent and lean forward from your waist. Slowly swing your arms back and then overhead and down to grab your ankles. This is not a stretch for your hamstrings so ensure your knees are bent enough so you do not feel a stretch there. While holding your ankles, gently push your head down towards the floor. When this is done properly, you will feel your spine and lower back relaxing and releasing those tight muscles. Runners always seem to be in a rush and struggle to find time to stretch. Here are two ways you can easily squeeze in a stretch after running. Removing your running shoes - Never try to remove your shoes without first untying them. You can easily pull a tired muscle by tugging too hard with your foot. Instead, remove your running shoes in a standing position by bending over and slowly untying your shoes. Bend your legs if necessary, but try to keep them as straight as possible. This will give you a nice stretch in your back and hamstrings. In the shower - While washing your feet in the shower, place the ankle of the foot to be washed on the knee of the other leg, which should be bent so that you are in a slight squat position. Wash your foot in this position and repeat with the other foot. Holding this position stretches your IT band - a necessary stretch for most runners and will take no extra time at all! A word of caution - make sure you are well-balanced and supported if you decided to stretch while in the shower. Check out the video on how to stretch the IT Band in this article. Take time to stretch. Make it a part of your regular routine. Remember how good it feels and that it is good for you too! For the first couple of years that I began running, I needed to stretch a lot and very often. All my muscles were so tight and sore. I stretched all the time to try to get relief. Now, I no longer need to stretch. Since I was introduced to the Feldenkrais Method and body awareness, My muscles don't get sore anymore. I have learned how to keep my body relaxed and how to move my body so it doesn't create tension and tightness in my muscles. I feel so blessed to have been introduced to this powerful practice. It has changed my life. You can read more about my experience here: The Feldenkrais Method. 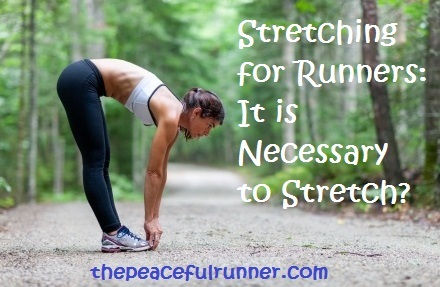 Do you think stretching for runners is necessary? Is so, do you think you should stretch before running? Please share your experiences below. Tell us what works best for you. Do you stretch before or after your run? Do you wait before stretching or do you stretch immediately following your run? What are your favorite stretches? Share your story here with your fellow runners and include a picture if you prefer.